This column started in the last year (2010) of the past millennium. 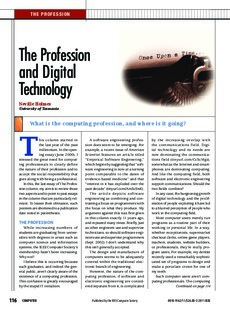 In the opening essay (June 2000), the author stressed the great need for computing professionals to clearly define the nature of their profession and to accept the social responsibility that goes along with being a professional. In this, the last essay of The Profession column, the author's aim is to review those two aspects and to point to past essays in the column that are particularly relevant. To lessen their obtrusion, such pointers are shortened to a publication date noted in parentheses.